Asian flavours, crabmeat and sweet, fresh corn. Usually when one sees “on sale” corn at the grocery store they think of corn on the cob. Although very good, it’s just one way to use those sweet kernels. Often my mind turns to this soup. It’s delicious, and surprisingly filling. This week one of our local groceries have six ears on sale for $1.98. That’s a good price, but it isn’t local. This recipe takes four so the corn cost is a mighty $1.32. Not bad at all. 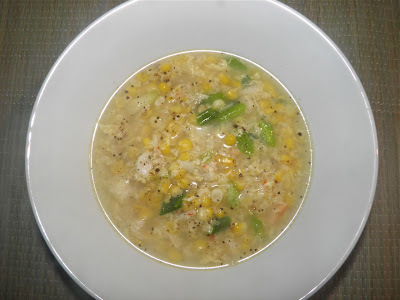 Many people overcook their corn. Even just on the cob it shouldn’t be boiled for more than 5 minutes. The short cooking time preserves the sweetness, I believe. It’s a shame the price of crab isn’t as affordable. Whatever money is saved on the corn is – sadly – “redistributed” to purchasing that ingredient. Canned lump crab will cost you $6+ for 120 g. Yes, I typed that correctly. Even the cheaper 15% leg meat will set you back over $3 for the same size can. This recipe takes one of each... Sometimes this soup is made with the crab flavoured pollock, but I just can'e see it being even remotely the same. You could also steam and clean your own crab for less cost, but that's a job all in itself. I guess you have to put the whole thing into perspective. If you were buying steak how much would you get for $10? Not much, and this recipe will feed four. 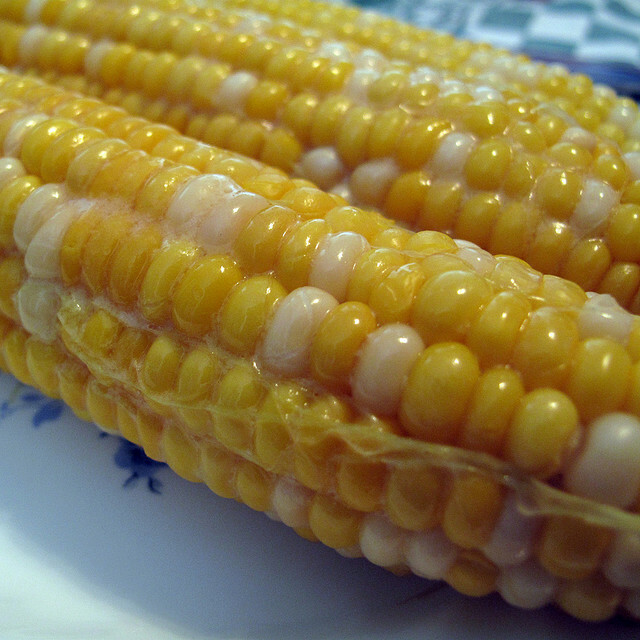 Fresh corn kernels can be removed quite easily. They only take a few minutes to cook and the taste is so much better than canned or frozen. There’s a sugary taste to the fresh kernels that just doesn’t compare. Removing corn kernels from the cob is a bit of a messy procedure, I have to admit, but it can’t be simpler. Just run a sharp knife down the sides and the kernels come off easily. Some suggest doing it over a bowl. I use a cookie sheet so the mess is at least minimized. It’s also easier to cut off the kernels over a flat surface than in a bowl. Assembling the soup is so fast it’s amazing. Mere minutes will have piping hot soup ready to serve your hungry family. Mince the thai chilli and ginger and set aside. Remove the kernels from the cobs and set aside. Heat the sesame oil in a stock pot and sauté the ginger/chilli for about 30 seconds. Add the chicken stock and bring to a boil. Then add the corn kernels. Let cook for between 3-4 minutes. The kernels will be barely cooked. Add the crab with whatever liquid is with them in the cans. It has a lot of flavour you don’t want to waste. 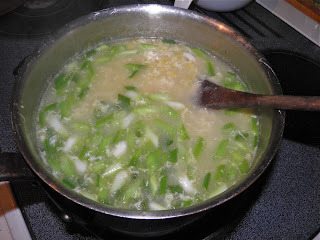 Bring just to a simmer and then add the green onions. Once the pot comes back to a simmer slowly drizzle the beaten eggs on the surface of the soup while you stir. It ill break up into thin strands. Taste for salt and adjust. Stir in the pepper and serve.